In the Dark is gripping investigative storytelling. The Trials of Curtis Flowers presents the story of Curtis Flowers, a black man tried six times for the same crime – a quadruple murder in a small town in Mississippi – and a white prosecutor determined to have him executed. The reporting team moved to Mississippi for a year to track down witnesses and documents. They undertook an extraordinary data journalism project – extracting race information about jury selection from hundreds of trials over two decades – and discovered that prosecutors in this district strike potential black jurors at a consistently higher rate than whites. In the Dark presents their findings: a story of unchecked power and race that raises profound questions about whether the criminal justice system is fair and just. This exclusive offering is based on the popular podcast - the first to win a prestigious Polk Award. We've created this one-hour special just for radio audiences. Since the series launched, the U.S. Supreme Court has announced it will hear Curtis Flowers’ appeal. We've updated the special and promos to acknowledge this. Should the Supreme Court decide on the case before the air window closes on August 31, the special will updated again to reflect its decision. APM Reports strives to raise awareness, trigger debate and prompt positive change via non-partisan, independent investigative and documentary journalism. In the Dark is a recipient of the 2016 Peabody Award and 2019 George Polk Award. 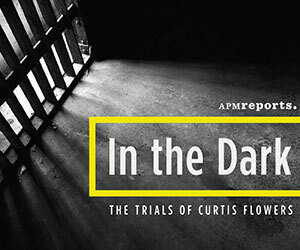 In the Dark The Trials of Curtis Flowers is available at no additional charge. APM Reports' award-winning journalism is included in your affiliation fee. Madeleine Baran is an investigative reporter for APM Reports and the host and lead reporter of the podcast In the Dark. Baran's work focuses on holding powerful people and institutions accountable. Her reporting has exposed flaws in law enforcement investigations, forensic science, state-run mental health institutions and other areas. Baran's reporting has also appeared on NPR and has been cited by the New York Times. Baran has received numerous national awards for her reporting, including an Alfred I. duPont-Columbia Award, regarded as the Pulitzer Prize of broadcasting, two George Foster Peabody Awards, a Gracie Award, and two national Sigma Delta Chi awards. October 29, 2018 – August 31, 2019, with multiple airings permitted. Note: Air window may be shortened pending legal proceedings or appeals. Stations will be notified of any changes via ContentDepot. Customizable ads and guidelines for your website and social media promotion. Affiliate stations may carry this program multiple times before August 31, 2019. The program must be carried in its entirety. No excerpting is permitted. Simulcast streaming rights are available for this program. Prior to carrying this program, stations must contact their American Public Media Station Relations Representative. Questions about carrying APM Reports programs? We're here for you.